Definitions of the Greek words sanctify and sanctified and their usage in verse 19. Jesus sanctifies (Performs Holiness) so they [disciples] receive his sanctification is what this all means. Hebrews was written (I believe anonymously by Paul, partly fulfilling Acts 9: 15, Jesus’ prophetic command, ordaining Paul) to clarify for Jews the law is set aside (See: Hebrews 7: 11-22) by the New Covenant prophesied in Jeremiah 31: 31-34 and completely accomplished by Jesus. No more bulls, rams and goats required. The rapture Jesus says is coming soon is necessary to protect the holy ones [all who believe in Christ Jesus because of the apostles’ testimony from their seminary trained preachers who would sacrifice animals in the coming temple to show solidarity with the Jews. This would be Abomination. Jesus has completed the work the Father sent him to complete. Rest in his atonement. See Leviticus 23. Chris Queen 2/9/2019. Please hit the Follow key above, to the right for future updates. Your valued comments may be entered in the form below. 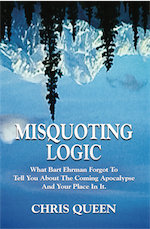 My books Misquoting Logic and Misquoting Calculus lay the individual relationship with Jesus through his ever present Spirit of truth and God prophetic meanings correlating on the timeline of history. “Do not let your hearts be troubled and do not be afraid.” Jesus.